Luke Bryan’s songs are almost all centered on women, but those women themselves are rather shadowy figures. 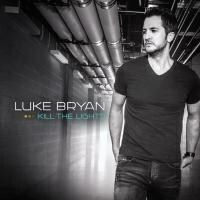 Anthony Easton’s ideas about Bryan and pleasure seem as good a place to start as any, when it comes to tackling Luke Bryan’s new album Kill the Lights. Or at least the notion of pleasure as central to his music came to mind for me, on first listen, by the third song of the album, when Bryan puts into our brains the sound of his belt buckle coming loose and his jeans hitting the floor. That song, “Strip It Down”, is about a couple stripping everything away -- their clothes, obviously, but also slamming their cell phones down -- to try and get back to what they used to be. What they used to be we can surmise, but it involves back roads and “little bare feet” next to cowboy boots, an image that at the least makes you wonder how long they’ve been together and at worst seems creepy. Actually the song before it, the title track “Kill the Lights”, is probably a better example of Bryan’s focus on pleasure. Musically it wears it more on the surface, with a sensuous (and sensual) Michael Jackson-ish, disco-ish groove that made me ponder theorizing Bryan as country’s Justin Timberlake. This song’s all about reckless abandon, about unfussed-over pleasure; “skin and skin don’t care where we’ve been”. Again where they are is down a back road, which is Bryan’s perpetual fantasy place (country music in 2015 is all about fantasy, by the way). The first song on the album, “Kick the Dust Up”, goes there, too, for a more communal type of pleasure: a party in a cornfield. That song’s sense of fantasy has some humor to it. The song dips into hick-hop about as far as a few of Bryan’s past hits, and the farmers in the song seem to be imagining themselves as high-rolling ballers, “beautiful people” driving their pickups like they’re Cadillacs, drinking Everclear instead of fancy cocktails. “Fill your cup up / that’s what’s up up”. On any Luke Bryan album, you’re never far from a rural landscape used to embody something -- nostalgia, dreams, youth, freedom. On “Way Way Back” it’s all of those. To get back to where they once were, remember how they met, they need to return to a “no name road” across the train tracks. That was their place for escape -- and baby, we should make it so again, he says. In some ways the song is similar to “Strip it Down” in that fantasy for returning to an imagined utopia of the past. Both songs also use the phrase “old school”, for what it’s worth. In the song he’s peddling what we smarter-than-thou listeners imagine is probably more fantasy than reality for the narrator. “Wouldn’t you like to go there, baby?”, he asks to the woman in the song and, perhaps, Bryan is asking listeners the same. For some reason Luke Bryan is a bit of a lightning-rod figure in popular music. An incredibly popular, rather innocuous, if fratboy-ish superstar who’s viewed by many as the evil embodiment of “bro-country”, of the subgenre where macho cowboy types sing about their trucks, more likely to be named than the barely sketched-out, unnamed women they’re romancing next to riverbeds. Bryan has all that in his music but interests me more than most of his peers, for a few reasons. He’s interested in dipping into hip-hop without diving wholehog in, akin to a fan (think of Taylor Swift singing along to Kendrick Lamar, more so than “hick-hop” like Colt Ford). He’s less likely than many of his contemporaries to put up the false cover that he’s somehow carrying on the tradition of Johnny Cash, Willie Nelson, et al. ; his songs often are more intensely devoted to a feeling or idea than they first seem to be. And of all the current country singers bringing up dirt roads and farmland, he often gets closest to the agricultural or geographic details. “Huntin’, Fishin’ and Lovin’ Every Day” (a title I find hilarious, by the way, for how neatly it summarizes how some of us imagine the subgenre) resurrects city vs country hogwash but does so by focusing not on the city (besides a reference to smog) but on the country. Again he tries writing his own high-living, hip-hop-style catchphrases -- “I’m gettin’ red dirt rich and Flint River paid”. Perhaps I’m just impressed by these references to specific places, instead of the typical generic references to “the country”..
Bryan and his co-writers are more likely to get specific about a type of grain or a model of fishing pole than they are to fully describe a person. Like any best-selling middle-American heartthrob should, Bryan gears his songs towards women. The CD package includes nine different photos of Bryan: smiling, mostly, and occasionally looking pensive. The songs are almost all centered on women, but those women themselves are rather shadowy figures. In “Kick the Dust Up” he’s calling somebody “baby” and “girl”, but who is she? There’s a moment (“park it and we pile out / baby, watch your step now / better have your boots on”) where I feel firmly that there’s no woman in his presence and he’s giving instructions in his head to the woman he hopes he’d meet in this entirely imagined scenario. On “Kill the Lights”, “Strip it Down” and “Way Way Back” they’re getting it on, or he wants them to, but what do we know about her, the one he repeatedly calls “baby”? Not much. “Love It Gone” paints the same scene with the additional details that she wears lipstick and had a rough day (and has a “secret menu” of lingerie”). The more austere love song “To the Moon and Back” has some backing vocals that bring in “her” voice, but again she’s a general “you”. A few songs attempt more of a narrative, but it’s still more an outline. In “Razor Blade” there’s the prototypical woman who’ll pick you up at a bar and then cut you like a knife… no, wait, not like a knife, like a razor blade. In “Just Over” she’s leaving him, surprising him when he thought she’d come over and reignite his flame (so to speak). “It don’t matter where she’s headed / she’s gone gone gone”. “Move” gets the closest to telling a woman’s story, but still it’s all male fantasy: the new girl turns out to be hot and wild. She adopts the ways of the South, the cut-off jeans and the accent, without losing the wildness. The best thing about that song is the way she paralyzes him. The song has a current of male sexual dysfunction in it, of his puffed-up male ego, the side of him that fancies himself a sexual stud, gets deflated simply by a woman being a woman. “I wanna move when you / but I can’t move when you move”. So bro-country this is, in that the women are shadows and might be figments of the man's imagination. The exception might be the song where a real-life woman is allowed to share the stage, one of the album’s highlights. “Home Alone Tonight” is a duet with Karen Fairchild of Little Big Town that’s probably as much a fantasy as any of this, and still ends with him hooking up with someone (of course), but takes pleasure in other people’s misery. Two broken-up-with people meet in a bar, do shot after shot, take selfies and send them to their (now)-exes so they can gloat. The way they accentuate the shots themselves keeps the song in that pleasure zone, while the revenge-fantasy angle emerges a nastier streak than Bryan usually lets himself take on.